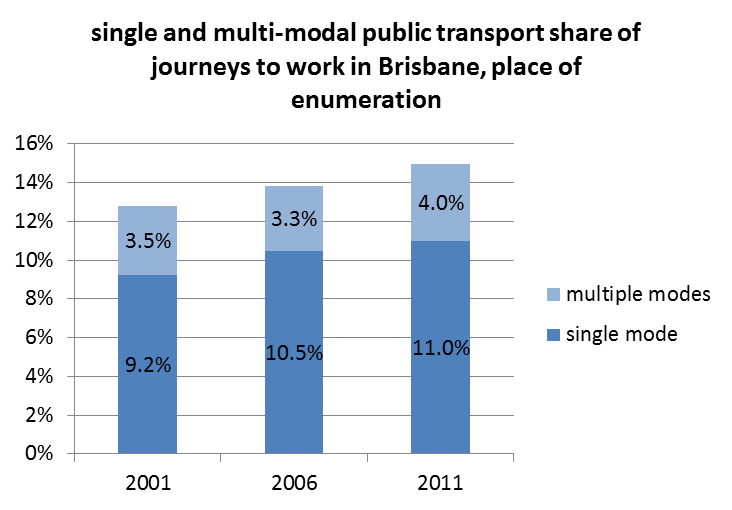 How have mode shares of journeys to work from different home locations changed in Brisbane? What impact have recent bus service level improvements had? In my post on city level mode share changes we saw that Brisbane had a 1.2% mode shift to public transport between 2006 and 2011. This post will uncover which areas shifted the most. The following animations show various mode shares for journeys to work from census collection districts for 2006 and Statistical Area Level 1 (SA1) for 2011. These are the smallest geographies available for each census. All the data is by place of usual residence. I’ve animated each image to alternate between 2006 and 2011, so you can gaze at them and spot the changes. You’ll need to click on them to enlarge and see the animation. You can mode shift in the inner suburbs, The Gap, the Albany Creek area, around Shorncliffe, the middle southern suburbs (between Yeerongpilly and Woodridge), and the strip towards Shailer Park. Much less mode shift is evident in the outer suburbs, particularly Ipswitch, Victoria Point, Cleveland, and Redcliffe. The Springfield growth area shows higher mode shares than average for urban fringe areas without heavy rail. This map excludes those who used private transport to reach public transport. In most outer suburbs of Brisbane, it seems the vast majority of people are using private motorised transport as part of their journey to work, including to get to train or busway stations. Significant mode shift can be seen along the Ferny Grove line, the Shorncliffe line, and the line towards Darra. I can see little mode shift on other lines. There was modest mode shift towards train in the Inala area (near the Richlands rail line that opened in early 2011). Perhaps it will take some time for commuting patterns to change to take advantage of the rail line? Note that a significant share of people in Springfield used trains. They will be getting a train closer to home when the rail line extension from Richlands to Springfield opens in 2014. It appears that only a few of them got to the train by feeder bus, as the next map shows. There was significant shift to bus use in the southern suburbs, particularly around the South East Busway (shown in purple). This busway opened in 2001, but it seems mode shift has continued. There was also strong shift in South Brisbane and the West End (where the high frequency CityGlider bus was introduced), out to The Gap, to the inner south-west, the inner northern suburbs between the train lines, and south through Calamvale (north of Browns Plains, now served by high service “BUZ” bus routes using the South East Busway). There was little shift to using buses in the outer suburbs, other than in the Browns Plains area which is now serviced by BUZ routes. There are some significant changes, particularly around the West End (south-west of the CBD) where ferry mode share collapsed (perhaps due to increased bus service levels and disruptions to ferries following the 2011 floods). Ferry mode share also dropped in the St Lucia area, and for students on the University of Queensland campus. I suspect this might be to do with increased bus service levels. There was strong growth in ferry mode share in Bulimba (north-east of the CBD), following the reopening of the Apollo Road Ferry Wharf in 2008 (which on these maps seems to have been a success) (Apollo Road wharf is the furthest downstream ferry wharf on the south bank). Train and bus journeys increased share in many areas around Brisbane (note the different scale). Notable areas include around Ferny Grove, North Lakes, along the Beenleigh rail line, along the rail line to Darra, and in Springfield. However these are all very small mode shares. Integrated fares were introduced in 2004/05 eliminating the fare penalty for changing modes. There was a slight drop in multi-modal public transport mode share in 2006 (compared to 2001), but then a substantial rise by 2011 (faster than growth in single mode journeys). I want to explore multi-modality in journey to work data some more soon. Stay tuned. Here’s a map showing the overall mode share to public transport in Statistical Local Areas (SLAs), the smallest geography where data is available for both 2006 and 2011 (you’ll need to click to enlarge, and unfortunately my GIS software doesn’t give every SLA a label ). The biggest mode shifts to public transport on this map are in Pallara – Heathwood – Larapinta (mostly sparsely populated), around Darra-Richlands (where the new train line opened), Calamvale (new BUZ routes presumably), and around the end of the South East Busway. Pinjarra Hills has a shift but only 139 people travelled to work from this SLA in 2011, so it only takes a few people to register a larger mode shift. And before you get excited about the airport area (Pinenba-Eagle Farm), only 144 people travelled from there to work in 2011. I’ll look at mode share by work location in a later post. The biggest shift away from public transport was in Yeerongpilly, whilst other SLAs with significant drops include Fairfield, Geebung, Holland Park, and Highgate Hill. Not sure what the reasons might be in those places. There was a slight shift to walking in the inner city areas, notably around Woolloongabba, Paddington, and Wilston. Walking mode share was highest around the CBD, Fortitude Valley, and around St Lucia/University of Queensland (UQ). Cycling has grown rapidly (off a small base), particularly in the inner suburbs include around St Lucia/UQ and West End. I’m sure other people will find more patterns – please comment on any interesting finds. This entry was posted on Sunday, November 4th, 2012 at 9:07 pm and is filed under Brisbane, Mode share, Mode shift. You can follow any responses to this entry through the RSS 2.0 feed. You can leave a response, or trackback from your own site. This is a proportional shift, I bet the actual numbers (quantum) won’t have changed much, however the influx of high wealth people in the Yerongpilly Tennis Centre riverside development mean of those living in the area, less are reliant on public transport. Further, students/staff of UQ who live in the area may now ride or walk to UQ via the Eleanor Schonell Bridge, rather than rely on public transport. Hi Chris. Excellent analysis and great to get it so soon after its release. In June 2011 there was a significant restructure of the Ipswich and Caboolture rail timetable to deliver an all day 15 minute frequency between Darra and Northgate. Express operations were also consolidated to operate from Darra and Northgate. Therefore I am not surprised by the increases in mode share on these lines. I can’t help but think the extra road capacity provided by the new Ted Smout bridge (http://www.brisbanetimes.com.au/queensland/australias-longest-bridge-opens-at-redcliffe-20100711-1059m.html) between Redcliffe and Brisbane contributed to the decline in mode share in Redcliffe. It sall be interesting to see if the new Moreton Bay Rail Link (http://www.tmr.qld.gov.au/Projects/Featured-projects/Moreton-Bay-Rail-Link.aspx#rail) can reverse this trend although it may not be operational by the next Census. As the South East Busway continues to provide faster and more reliable travel times compared to cars on the adjacent congested Pacific Motorway I’m not at all surprised it continues to erode car mode share, even ten years later. The SEB with 10 stations continues to carry more pax each day than the entire rail network in SEQ. I suspect the 385 BUZ has contributed towards positive PT mode share in The Gap. The Inner northern Busway extension to RBWH and the missing CBD section bteween Roma St and Queen St no doubt accounted for increased inner north mode share between the rail lines. The ferry network patronage has been in decline for a few years. While many of the terminals were out if action for a period after the floods, I think the Green Bridge (Eleanor Svhnolle Bridge), Boggo Rd Busway (Eastern Busway stage 1) and 412 BUZ would have contributed to this decline. Essentially bus is a more frequent and more direct travel option between the city and Uni of Qld compared to the CityCat. Please also remember the Dutton Park ferry service (private non-TransLink operator) ceased operation to UQ when the Green Bridge opened in Dec 2006. Also since the Teneriffe CityCat terminal opened, the passenger numbers at the Teneriffe CityGlider terminus have increased substantially. I suspect what is happening is that people living in Bulimba are catching the CityCat at Apollo Rd and Bulimba terminals to Teneriffe and then transferring to the CityGlider to travel to the CBD, South Bank and West End. This is a much faster and direct option compared to catching the CityCat. I suspect mode share has declined in Fairfield, Yerongpilly and Highgate Hill as a result of the floods. Many people still have not rebuilt or returned to these areas. Also agree that the new high density development at Tennyson is not a PT Market. In Oct 2010 there were significant improvements to bus services in North Lakes feeding to rail. This was further strengthened with the Caboolture timetable change in June 2011 where more express rail services operated from Petrie station. I suspect the opening of Richlands Rail station in Jan 2011 helped increase mode share in Inala. The very large park n ride was full from day one. Bus services were also restructured to feed to Richlands and Darra station. 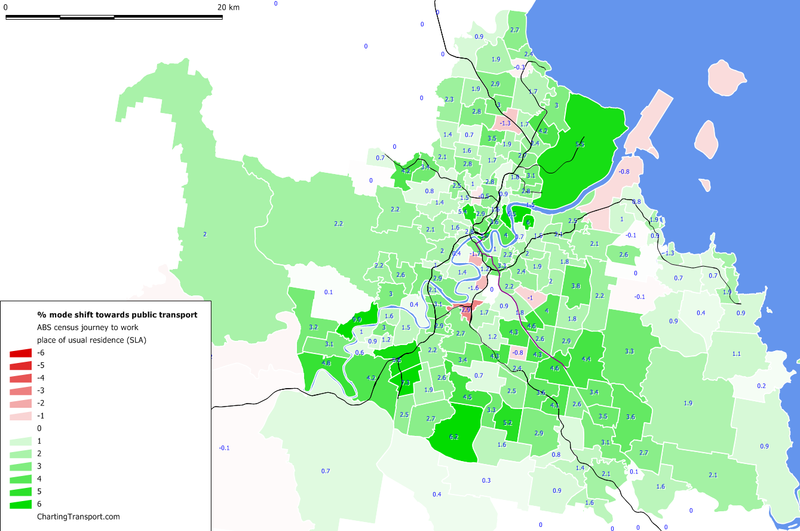 It is fair to say the majority of investment in bus services in Brisbane has been in the south as this was where new depot capacity was provided between 2006 and 2011. Heathwood and Pallara would not have had PT in 2006 but did get bus services for the first time in recent years – so the shift is coming off essentially a non-existent base. The Ferny Grove line has had some significant investment since 2006 to increase capacity (track duplication, larger park n rides, new bus stations and improved feeder bus services especially to Ferny grove and Mitchelton stations). The airport mode share is disappointing however bus service can’t service the airport terminals to protect Airtrain’s capital investment. There has been so much construction activity in this precinct that severely impacted on bus services – Gateway Upgrade Project, signalisation of the airport round-about, construction of Airport Link and the flyover and the Northern Access Rd from the gateway. Land use at the airport is slowly changing but is still very industrial (non transit supportive) and blue collar worker. A Airport Village (no 1 Airport Drive) ramps up this will change. A new depot will open in 2013,14 at Eagle Farm (Trade Coast Central) which will no doubt result in improved bus services. The biggest issues with the airport site is the lack of connected roads making it difficult to service with bus in a cost effective way. For example there is no connectivity between Trade Coast Central and the Brisbane Airport Corporation owned roads. There really needs to be some GreenLinks (bus only) connections provided if the BAC expects PT Mode share to increase at Australia Trade Coast Central North. I suspect the next Census will show positive changes in mode share at the airport following the opening of Northern Busway in Late Aug 2011 and Airport Link in 2012 and new cross town bus services to the Airport Village (routes 369 and 590).